Cheese. I love cheese. My family has been in the cheese making business for over 130 years, and it is in my blood. My great-uncles were cheesemakers, my grandfather was a cheesemaker and my uncle is a cheesemaker still. There are even patrons still with my uncle that would send their milk to my grandfather all those many years ago. I didn’t realize my absolute love for cheese until I started working for my uncle in 2007. I was ready for a change in my career and was excited to start something brand new. I helped my uncle open a new store and run an existing store in Sauk City. I even had the chance to run his cooking school for two years before I was even luckier to have a beautiful baby boy. Finnegan changed everything for us. I didn’t stop working completely, but was able to bring him with me to work and meet of the people who love cheese as well. Surprisingly, Finnegan doesn’t love cheese. But his sister does…and she has expensive taste. After Isla was born, my cheese selling days basically ended except for December…when cheese is sent everywhere as gifts from Wisconsin. Who wouldn’t want cheese as a gift, right? 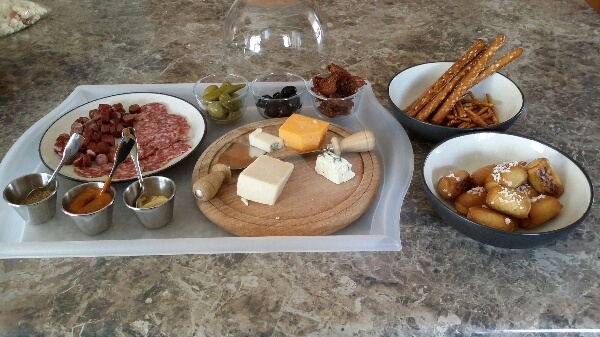 So this leads me to my favorite appetizer…the cheese platter. I choose the cheeses to compliment our meals and the other items served. It is my conversation piece, as well as my family history. I always have something from Carr Valley Cheese and sometimes other cheeses found around that Carr Valley doesn’t make. On this particular day, we had Carr Valley Cheeses 4 year old cheddar, Penta Cream Glacier Blue, Big Mutton Button and Bessie’s Blend. We had made a family trip over to the Mustard Museum in Middleton and served two of our new mustards as well. Boetje’s Stone Ground Mustard made in Illinios is Paul’s new favorite and a Hot & Smokey Mustard from Shemps Food Works. We also had a Dijon mustard as well. All of these mustards with the pretzals and sausages were a great accompaniment to the cheese. What is your favorite Wisconsin Cheese?